Exercise and physical activity can help significantly with stress management. Everyday life can be full of stress. Research has shown that some stress is good for us: it helps us perform at optimal levels. 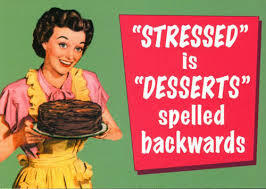 Too much stress, however, can have serious psychological and physiological repercussions. Research proves that a large chunk of top performers know how to manage their emotions in times of stress so that they remain cool, calm, and able to do what needs to be done. Here are few healthy and positive habits that you may want to develop to fight back stress and be successful! Drink plenty of water. Dehydration is often overlooked. When our body does not have enough we often feel lethargic, grumpy, and get headaches. We also tend to mistake hunger for thirst, so before digging into another sandwich, vada pao or bag of chips, drink a glass or two of water. Tea, Coffee, cold drinks or flavored drinks do not count as water. Stay active on a regular basis : Exercise produces natural endorphins, which help put us in a good mood. There is a lot of research that shows that exercise improves mood. If you are stressed, physical activity can get you in the right state of mind to be able to identify the causes of your stress. Exercise won’t make your stress disappear, but it will reduce some of the emotional intensity that you’re feeling, clearing your thoughts and enabling you to deal with your problems more calmly. Exercise will also help you get proper sleep and calm you down. 3. Accept your feelings.If someone close to you has recently died or you can’t be with loved ones, accept that it’s normal to feel sad and grieve. It’s OK to take time to cry or express your feelings. You can’t force yourself to be happy just because you are expected to. Accept your responses and give it some time, whether it is anger, desperation – but acceptance does not always mean expression. You need not burst out in anger or frustration on someone else. When you know you are angry – acknowledge it and follow anger management techniques and let yourself calm down. Success will follow automatically if you can apply this to other everyday emotions too. 4. Stay Positive : Successful people tend to be those who can see opportunity for growth, walking over their failures. Look for lessons to be learnt when something goes wrong, instead of falling in gloom or blame game for what went wrong. Try reframing negative thoughts. If you find yourself dwelling on something negative, try adding, “But what I can learn from this is…” Even just noticing that you’re stuck in a negative thought can help you move away from it. There’s a solution to any problem. Stay Connected with loved ones : Staying amid the loved ones can help bring down anxiety levels so easily and dramatically. Reach out to people who matter to you every once in a while, they can offer support and friendship. Sometimes talking to someone completely unrelated to your difficult situation (read friend or family) can throw up a beautiful new wayto deal with your stress causing situation ! If the situations do not permit to spend enough time with the family or kids, you may want to keep a pet for company. If you can care for one, they surely can make you feel loved and bust your stress. Pets are regularly used, worldwide as an effective tool in several therapies involving emotions. Nurture a hobby: No one can lead a stress free life if they keep harping on that one same thing round the clock. Indulging in a hobby that takes away the mind to doing something you feel more passionate about, away from work – gives a good break to the mind to detangle from the drudgeries of everyday anxieties. Focus on progress, not perfection: No one is perfect. Not even the most successful people on the planet are perfect. Richard Branson, the very famous owner of Virgin Airlines, for example, has had some well-known failures in his time, yet has always been blunt about his belief that you fail quickly, fail big, learn from it, and move on. Many of us are obsessed with perfection, but letting it go may relieve us from a big baggage of stress. Love yourself : It is important for you to realize that the most important asset you have is your own self and that it must be looked after. Prioritize healthy habits like getting enough sleep, limiting caffeine and alcohol, getting proper exercise, and switching off from technology periodically. A lot of stress can be cut down easily by bringing down any of these – overly tired, overdose of caffeine and alcohol and constant interference of digital life. A truly successful person will strive to find balance to help moderate his stress. Get organized : One major cause of stress is the number of decisions we have to make in a day. Every decision from whether to wear a solid or a pinstripe shirt, cook a sandwich or salad, send your child to this class or that, all the way up to hiring and firing decisions – they all simply keep adding up to cause stress! Use a ‘to-do’ list; Build up a routine for simple things like answering emails at the same time, checking your social media once a day or even organising your table drawer can help save you from stress for the bigger decisions that really matter. Work smarter, not harder : Good time management means quality work rather than quantity. Our long-hours culture is a well-known cause of workplace illness. You have to get a work-life balance that suits you. Working smarter means prioritising your work, concentrating on the tasks that will make a real difference to your work. Leave the least important tasks to last. Most importantly – Try not to worry. In time, things always get better. The world won’t end if your joblist isn’t all done or your kitchen isn’t cleaned. You may need to do these things, but right now might not be the right time. I hope you find these tips useful. I am keen to understand how do you manage stress in your life? I’d love to learn your most successful stress-busters in the comments below. Contributed by Vaishali Gupta, an avid reader, writer and painter by hobby and an award winning Media Marketer by profession. She has keen interest in staying fit and keeps active despite a slipped disc.